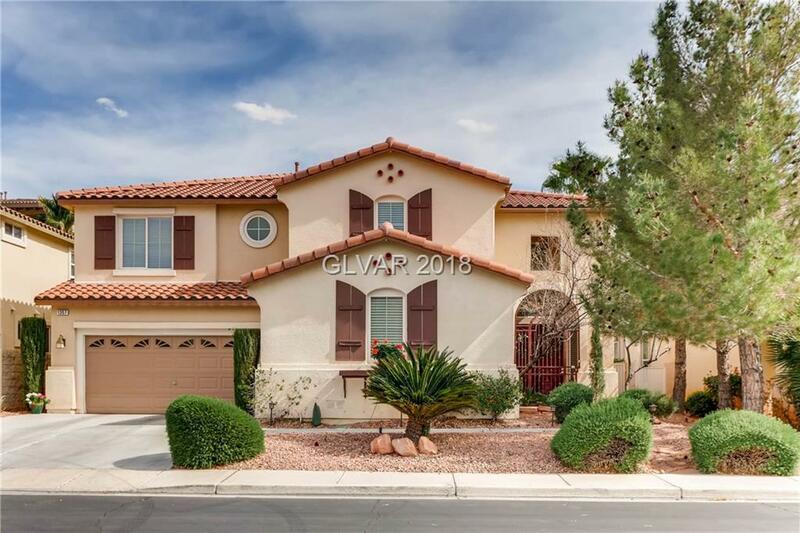 STUNNING 2 STORY HOME IN GUARD GATED SEVEN HILLS. 4 BED, 3 BATH, 3 CAR GARAGE WITH A LOFT ON 2ND FLOOR. MAGNIFICENT LIVING ROOM WITH ITS VAULTED CEILING. A BEDROOM & 3/4 BATH IS DOWNSTAIRS. SEPARATE LIVING & FAMILY ROOMS WITH DUAL SIDED FIREPLACE. KITCHEN IS A CHEF'S DELIGHT WITH DUAL OVENS, RECESSED LIGHTING, PANTRY, ISLAND & BREAKFAST NOOK. ENJOY YOUR PRIVATE BACKYARD. WELCOME HOME! ADDITIONAL FEATURES SHEET ATTACHED. Directions: From Seven Hills Dr & Grand Hills Dr -- Head South On Grand Hills; Right On Marsala Way; Right On Carmelo Dr. Carmelo Dr Turns Into Volturno Way.